First-ever biomimetic lower-limb robotic exoskeleton developed. Stroke and spinal cord injury patients often require gait rehabilitation to regain the ability to walk or to help strengthen their muscles. Wearable robot-assisted training is quickly emerging as a method that helps improve this rehab process. However, most current lower-limb rehabilitation robots simplified the knee-joint as a pin joint. The centre of rotation of the knee-joint is commonly fixed, which does not match the human knee-joint and limits the workspace of the knee-joint to a fixed arc. Now, a study from researchers at Beihang University and Aalborg University designs a lower-limb robot exoskeleton, a wearable robot, that biomimics natural knee movement to greatly improve patients’ comfort and willingness to wear it for gait rehab. The team state that their robotic exoskeleton is intended to help stroke patients strengthen their physical fitness, aid the rehabilitation training of paralyzed patients, or to assist those who need help performing daily activities. The opensource study is published in the journal Review of Scientific Instruments. Previous studies show that since a patient walking with an exoskeleton is a closed kinematic loop, it is different to normal human walking without an exoskeleton open kinematic loop. If the movement of the exoskeleton is not transparent to natural human movement, it will exert extra forces on the knee-joint. The extra force will lead to patient discomfort and an unnatural gait. The current study designs an adaptive knee-joint exoskeleton using a cam mechanism to investigate the effects of different exoskeleton designs on the internal joint forces/torque in the knee. The current study designs a biomimetic, parallel knee-joint to improve the bio-imitability and adaptability of the exoskeleton. Specifically, the team’s exoskeleton taps a hybrid serial-parallel kinematic structure consisting of a 1-degree of freedom (DOF) hip-joint module and a 2-DOF knee-joint module in the sagittal plane, and a planar 2-DOF parallel mechanism helps to fully accommodate the motion of the human knee, enabling rotation and relative sliding. The lab state that their design is the first known use of a parallel mechanism at the knee-joint to imitate skeletal muscles. They go on to add that unlike most previous exoskeletons, which simplified the knee-joint as a pin joint, theirs provides 2-DOF to make the exoskeleton’s movement consistent with a patient’s natural movement. Results show that an adaptive exoskeleton can minimize internal joint forces during the knee-exoskeleton interaction. Data findings show, via the kinematics and performance of the exoskeleton, that the new mechanism can improve the bio-imitability and adaptability of the exoskeleton knee-joint. 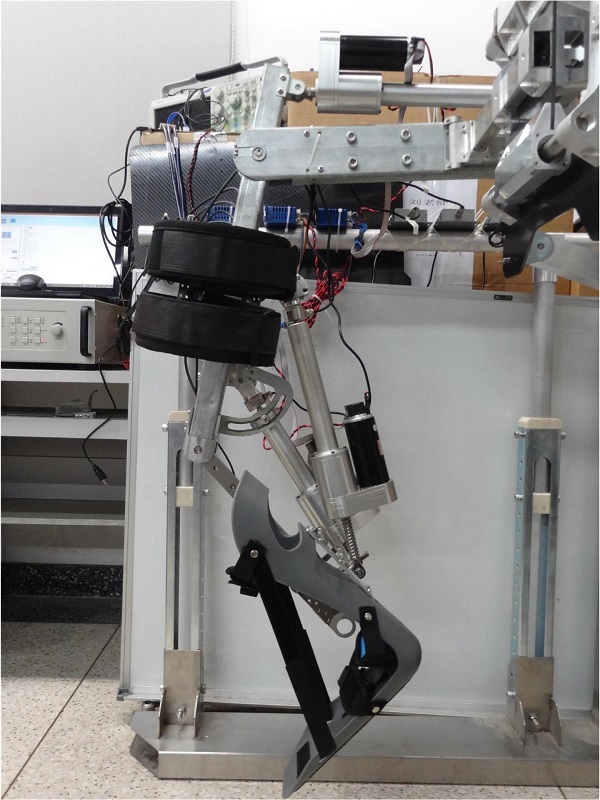 The team surmise that they have achieved biologically-inspired 3-DOF lower limb exoskeleton for human gait rehabilitation, showing that the lower limb exoskeleton is fully compatible with the human knee-joint. For the future, the researchers plan to control their exoskeleton via patients’ electromyography signal, which records electrical activity produced by skeletal muscles, so that they’ll be more actively involved in their training. This is a prototype of the lower-limb exoskeleton being developed at Beihang University in Beijing, China. Credit: Beihang University.